You believe that your child has been seen by a doctor without you being present and you are worried for their health and well being. In both of these scenarios, you will want to know whether you are entitled, as a parent, to know this information. Do Parents Have the Right to See Their Children’s Medical Records? If your child is under the age of sixteen then you may be able to see your child's medical records. Firstly, you must have Parental Responsibility for your child. If so, you can apply to a health professional for information and they must provide it. If you wish to see a GP or other medical practitioner, they are obligated to see you and to discuss matters relating to your child's health. If you contact the medical practice and are having difficulty with access, then it is best to put your request in writing. You jointly registered the birth of your child with the mother (after 01 December 2003). Can You Be Refused Information? The answer is yes. If it is considered in their best interests to share information with you and if the child is considered too young to understand your application, then the health professional will usually share information. They can only pass information on to you if they have your child's consent. If, therefore, you child is a teenager and they have asked the doctor something that they wish to be treated in confidence, then you will not be informed upon request. There are teenagers who wish to talk to their doctors about matters concerning them such as birth control, without their parents knowing. 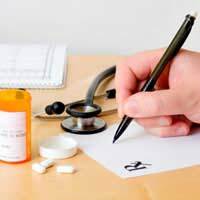 They may also refuse information if they believe that their patient will suffer serious harm to their physical or mental well being or to any other individual. Other scenarios may include where your child's information contains further information about another individual and upon revealing your child's information, the other individual's right to confidentiality could be trespassed. How Should You Approach a Health Professional for Information? If you try to contact you GP or any other health professional and are unsuccessful, then the best way to make a formal request is to put it in writing. If you include a copy of your Parental Responsibility Order or marriage certificate, or your child's birth certificate with your name on it (after 01 December 2003 if you are named as the father), then this might speed up the process. If you do not include this, then you may be asked to provide it at a later date. What Can You Do If Your Request Is Refused? As detailed above, there may actually be a really good reason as to why your request for information has been refused, though perhaps, as a concerned parent or guardian, you may not agree. If you are really concerned, you should ask the professional how you can make a complaint. The first person to complain to is the General Practice Manager. If this does not work, then you may wish to apply to the Information Commissioner or to the Local Area Health Authority, if you wish to access records, which have been refused. What About If You Do Not Know Who Your Child's Doctor Is? If you are unable to find out who your child's doctor is, for example, their other parent has not told you, then you can contact the Primary Care Trust or your Local Area Health Authority (the Local Authority in which your child resides) to ask for the details. You must make a request in writing, again making sure that you include proof of your Parental Responsibility. In summary, it is understandable that as a worried parent, you want to know all about your child's life. For younger children, it is important for you to be highly involved in their health. It is important, however, to remember that a health professional has an overall duty to do what is in the best interests of their patient and sometimes that means keeping their information confidential. i have just tried to get my kids medical records and have been told i cant have them as the mother of them has said she does not want me to have them.i have PR so how can they say no just cause my ex does not want me to see them? My ex and I are currently going through a custody battle with our 3 year old, he is not on our son's birth certificate and has no parental rights, however my ex has approached our GP and requested to see our son's medical records, he claims he has a court order and letter from solicitors, is this possible as I have not received any copy of the court order and I thought he would have to first apply to be on our son's birth certificate before he can begin any legal proceedings. My son is 16 can I ask to see details of appointments with counsellors he had when he was 15 without his permission? Hi I have recently obtained my daughers medical records from her surgery for support in an ongoing court case, some entries have redacted information which is understandable but the one entry we were really interested in, the whole thing is redacted. No information is visible apart from the appointment date and Dr? Is this right? I can understand redacting sensitive information but the diagnosis is surely the most important and classed as non sensitive as I can see all others? My partners daughter hasn't been to school for nearly a year, she has been assessed for ASD but neither the school or SEN department will tell him what the outcome is, the reason given is that she, his daughter and his ex say he shouldn't be given the information, can this be withheld legally ? I sent a letter to my son's surgery over two weeks ago (signed for so I know it was delivered) but have received no response. Should I wait longer and what would the next step be? If you have not yet received a response follow up with a reminder note. If that elicits no further response, make a complaint to the relevant Clinical Commissioning Group. Following up, the local primary care authority approached my son's mother for permission to have access to his medical records. This is despite my proving parental responsibility. Are they allowed to do this? I have asked the primary care authority who my son's GP is as he and his mother hardly speak. That was three weeks ago - they said my request has been passed to the appropriate department but they will not provide a direct contact. What can I do? HiAlthough it states that your child has to give permission for you to access their records, does this still apply if they are in a mental institution? "Patients with mental disorders or learning disabilities should not automatically be regarded as lacking the capacity to give or withhold consent to disclosure of confidential information. Unless unconscious, most people suffering from a mental impairment can make valid decisions about some matters that affect them. An individual’s mental capacity must be judged in relation to the particular decision being made. If therefore a patient has the requisite capacity, requests for access by relatives or third parties require patient consent. When patients lack mental capacity, health professionals are likely to need to share information with any individual authorised to make proxy decisions. Both the Mental Capacity Act in England and Wales and the Adults with Incapacity (Scotland) Act contain powers to nominate individuals to make health and welfare decisions on behalf of incapacitated adults. The Court of Protection in England and Wales, and the Sheriff’s Court in Scotland, can also appoint deputies to do so. This may entail giving access to relevant parts of the incapacitated person’s medical record, unless health professionals can demonstrate that it would not be in the patient’s best interests. These individuals can also be asked to consent to requests for access to records from third parties. Where there are no nominated individuals, requests for access to information relating to incapacitated adults should be granted if it is in the best interests of the patient. In all cases, only relevant information should be provided." Hi Although it states that your child has to give permission for you to access their records, does this still apply if they are in a mental institution? In my son's younger years he was diagnosed with ADHA, and other Mental, and Nervous disorders, and was placed on numerous medications. He had changed Doctors numerous times throughout his younger years, (Due to the Doctor leaving the practice, or our family moving out of state.) and each had either removed him from one medication, or added to them. At the age of 16 he decided he no longer wanted to take these medications due to the fact that they were causing other problems. The Doctor he was seeing at that time had no objections to his request. He is now currently 22 years of age, and has not suffered from any symptoms, or side effects of the disorders the Doctors diagnosed him of having, or from the medications he once took for them. Over the past 8 years either my recently deceased mother-in-law, or myself has tried to obtain life insurance on him as we have done with my other children, and have been denied coverage for him the fourth time now due to something in his medical records from a previous Doctor he had seen when he was 13 years old. My question is even though he is now 22 years of age can I be granted access to his medical records with his consent to see what is in his medical records that keeps getting him denied for life insurance being that I was responsible for him during that time frame? Your son can ask for access to his medical records - he could let you know if there was anything pertinent in them that might affect his life insurance. As a father (with parental responsibility), you have a right to know about important issues in your child's life; this includings issues relating to education, health etc. Your GP practice, should be able to tell you about your son's medical history, any good practice will be aware of this. Write to them formally requesting records, details of check ups, vaccinations, any treatment your child has received and copies of any documentation sent to your son's mother about the dyspraxia (or any the other medical conditions). Explain that you have already requested this information by phone and that as a parent with Parental Responsibility, you have the right to be fully involved in making decisions about any potential medical treatment and that the practice does not need the prior consent of the mother. Ask that your letter is placed on your child's medical record and that your name is also registered as an emergency contact if the mother cannot be contacted. This should be sufficient to force the practice to keep you informed. He should discuss this with the mother really. If she is ill during her with time with him, he can take her to her GP as he is the parent in charge of her care at that point. Hi, I was told today by surgery staff that a new rule has just been brought in saying we parents can no longer gain access to our 11 yrs or older children's medical record, results etc. by phone, online or otherwise. We'd require an appt. with GP to do so in which child was present. Surely this can't be correct? Blood results for example.does child phone up for them? You should let parents access their child’s medical records if the child or young person consents, or lacks capacity, and it does not go against the child’s best interests. If the records contain information given by the child or young person in confidence you should not normally disclose the information without their consent. Young people with capacity have the legal right to access their own health records and can allow or prevent access by others, including their parents. A child might of course achieve capacity earlier or later. In any event you should usually let children access their own health records. But they should not be given access to information that would cause them serious harm or any information about another person without the other person’s consent. Hi, I was told today by surgery staff that a new rule has just been brought in saying we parents can no longer gain access to our 11 yrs or older children's medical record, results etc. by phone, online or otherwise. We'd require an appt. with GP to do so in which child was present. Surely this can't be correct? Blood results for example ...does child phone up for them? Hi there, Hoping someone can help. I'm trying to find out which gp's my son is registered at. My ex took him away six years ago. He will be seven in December and I have been fighting to get proper access. I see him every two weeks now at a contact centre as it's a 500 mile round trip so can't do it every week. But I got a court order for this access and the judge also said that she needed to give me his school and gp info. She has given me the school info, but not the gp info.I'm not even sure where he lives as I just know it's in Southampton or Portsmouth somewhere. I do have full pr as I'm on birth certificate. Any ideas? There is information on how to obtain access to medical records on the NHS website here. You may need to consult a medical lawyer to help with accessing the documents, understanding them and taking action. I understand exactly where your coming from marky. I've been separated from my ex wife for over 3 years to discover my daughter is used for disability payments for global development delay . Through fighting thru the courts for access I've discovered that over these years she's usedevery organisation available without informing me . Recently I've been involved in a meeting with senco only to find there'snothing wrong with her . Which I knew anyway . At twelve years of age to be made to feel she has a problem just for financial gain is wrong on soo many levels . This will affect her for the rest of her life .